This brand of clearcoat is ideal for most table tops. One single coat can provide the appearance of multiple coats of varnish. Further layers will create a three-dimensional look that many people desire in their table top. It is easy to apply and self-levels. When dry, it is crystal clear, extremely tough, and resistant to a variety of adversaries that may normally damage tables. It is scratch resistant, waterproof, and even alcohol proof. This is made with no solvents and has a very low odor. This means that you will not have to worry about stinking up your home or garage if you choose to apply it indoors. 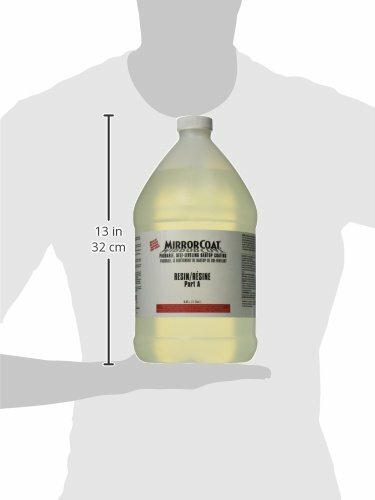 You can use the MirrorCoat on all types of surfaces. It can be used on stone, ceramic, concrete, wood, and even metal if it has been prepared correctly. 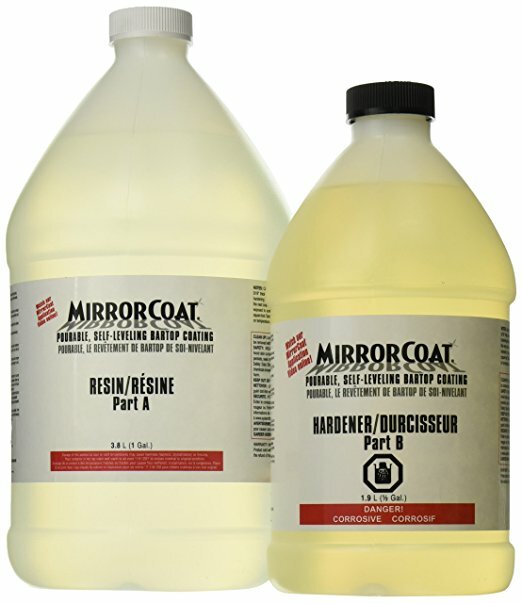 MirrorCoat is a two part, pourable resin and hardener that can be mixed in a ratio of two parts resin to one part hardener. This ensures that it is more heat resistant than many other epoxies available and one of the hardest as well. This kit will allow you to work with the mixture for approximately 20 minutes before it starts to harden. Once applied, it will be hard to the touch within about three hours. This is if you use 1.5 gallons over a 12 or 13 square ft. area. The coating will level out to be 1/8” thick. 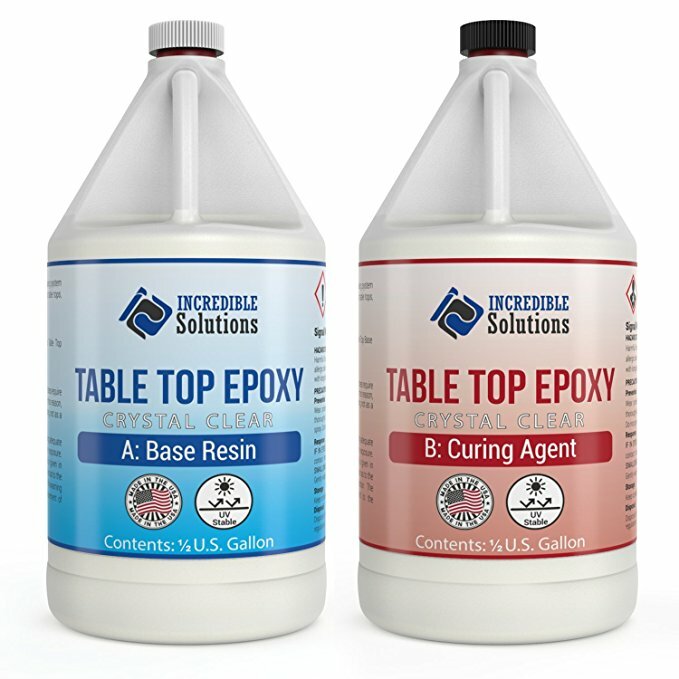 Is This Epoxy Easy to Use? Most people say that it is the best epoxy that they have ever used. They say that it is very easy to work with and that their projects always turn out exceptionally well. There are some people who have used it in less than perfect temperatures and climates, but they say that it still measures up to their expectations. Many do recommend that you mix it together in small amounts since you will not have long to work with it before it starts to set. It is also recommended that you mix it as stated clearly in various videos and writing. To make sure it turns out perfect, without bubbles, you will need to apply the flood coat to seal the wood. Then you may apply as many layers as you want. With this product, you have to be certain that you are working on a level surface. If your table is slightly off level, you may end up with an area being thicker than another OR you may have waves in the coating. This will require you to sand it down and perhaps reapply another layer. Also this is not sun resistant! There are others by System Three that have UV protection included. Is the System Three MirrorCoat Right for Your Projects? This epoxy is ideal for almost all crafts. When looking through reviews, you will find very few people who have had issues with it not setting properly. Most often this is because they mixed it wrong or were dealing with climate issues that prevented it from drying properly. We like that there are many people who have used this for years and never had any issues with it. It creates a harder tabletop and still has a very high gloss shine on it. We also like that it has a 4.﻿﻿﻿5-star rating after several verified purchases. It is a little more expensive than other brands of epoxy, but if you want quality it could be the best thing going.